After hearing much said about the existence of coal in various places in the County, curiosity and excitement led me to take a trip to the mines in Forkston and North Branch Townships, where coal was known to exist. Leaving Mill City early in a July morning, passed to Falls Station in time to take the morning train going north, in the course of an hour was whirling along the Valley of the Susquehanna to the Station opposite to Mehoopany, crossing the river at the rope ferry, soon after entered the quiet domicile of Hon. Henry Love; found him in rather feeble health, although apparently much better than he has been for some time past. After the usual salutations, was soon seated beside him in the parlor; the subject of conversation was of the past and present, of olden times and of the present, was of absorbing interest to both, and if the reader will bear with me through, he may find in it something interesting and entertaining. The Judge informed that he has lived in Mehoopany sixty years and that he is the oldest person now living in that place except Richard Lot, and Mrs. Carpenter; that he is of Hibernian origin, being the namesake of his grandfather, Henry Love, who came from the Emerald Isle before the Revolution, and enlisted in the war for American Independence; was artillery man under Gen. Knox, and was in the battles of Bunker Hill and Brandywine, and at the taking of Burgoyne; was wounded and lost a leg at the surrender of Cornwallis. John Love, the father of the Judge, was born in Eastern Pennsylvania, and moved to the township of Braintrim at a very early day, where the Judge was born in 1811, and was removed to Mehoopany when an infant. The first school he attended, was taught by Moses Overfield at Meshoppen. The first grist mill was built in 1806, on the Little Mehoopany, by William, Joseph and John Carney. At that time the confluence of the two Mehoopany Creeks with the Susquehanna were both at one and the same point; now by the wearing away of the river banks, they enter the river fully a half mile apart. The Judge recollects, when a boy, that Mehoopany was then new and wild, he saw at one time four bears in the river at a time. Game was abundant in the forests, and the river literally swarmed with the finest of fish, yet naught but gloom and poverty surrounded the earliest settlers. The Judge has in his possession some old title papers showing that the original land surveys were made as early as 1769. Nine years later, Col. John Butler, in the month of June, with his British, Tory and Indian army, consisting of 400 British and Tories, many of the Tories from Wyalusing, and 700 Indians, passed Mehoopany on rafts, boats and bark canoes, paddling their way down the river to the Wyoming Massacre. Mehoopany, Windham, Forkston, North Branch, Meshoppen, and part of Washington are parts and parcels of the original town of Braintrim, one of the seventeen townships under the old Connecticut survey. The succeeding hour was spent in conversation on what becomes a theme of general interest to all, in contrast. The glow of excitement now enkindles in the eloquent features upon the countenance of the Judge as he narrated the improvements now going on in Mehoopany. Changed and beautiful is its history of to-day. Mehoopany Village, a mile in length, is the largest and most business-like town on the west side of the river between West Pittston and Towanda. It consists of about 200 buildings of all sizes. It has two churches — one Baptist and one Methodist. One Select School, one Good Templars Hall, one Odd Fellows Hall, two milliner shops, two flouring mills, one saw mill and plaster mill, one steam foundry and Machine shop, five blacksmith shops, three wagon shops, one Fulling Mill and Carding machine, three Hotels, two Harness Shops, one Tannery, one Post Office, two Ferries, two shoemaker shops, one Stove and Tin shop, one Drug store, one Insurance Agency, Sewing Machine Agency and four stores. Improvements — Jacob C. Kintner’s new mansion house, the best in town, was built at a cost of about $7,000. W. H. Barnes has a large three story brick store. The Jennings’ Steam Ferry Boat when completed will cost $1,500. Maynard & Kintner have in course of erection a new store and Odd Fellows Hall. Some other new buildings have been commenced; also a new stone arch County Bridge over the Little Mehoopany is being constructed. Within the past year some nine or ten fine buildings have been completed. A new Rail Road route has been surveyed from Mehoopany, passing along the Big Mehoopany Creek, through the village of Forkston to the Big Falls, a distance of about twenty miles through a fine farming district one-half of the way, the rest through a dense forest of timber and coal lands; the real purpose and design of the road may not be made apparent to the settlers for some time to come. This road when constructed cannot fail of being a great benefit to the people of Forkston as well as to Mehoopany. 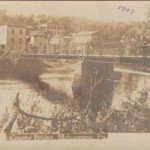 The public improvements on the opposite side of the river, the Canal and Rail road, in connection with this road, are destined to make Mehoopany a first class town for business. Ingham and Vose are now manufacturing some nice machinery. J. T. Jennings and W. Sturdevant, manufacture large quantities of the finest flour. The other mechanics are doing their share in that business. The township of Mehoopany is acknowledged to be one of the best, if not the best in the County. Theron Vaughn and Henning may be classed among the best of farmers. The Jennings Steam Boat is seen plying to and fro upon the Susquehanna where ninety years before, the dark and oriental features of the Indian warrior was seen paddling his bark canoe. After partaking of a bountiful dinner, the Judge gave me an invitation to take a stroll with him up town and calling on his friends and acquaintances, spent the afternoon leisurely and pleasantly together. There I learned that he had held various township offices — Justice of the Peace fifteen years, County Judge five years, County Auditor three years and re-elected for another term of three years; and that he has been a standing counselor in law matters for the last thirty-five years. Honest, industrious, and temperate in his habits, he has acquired for himself a decent livelihood. Having made this second acquaintance with him, I must say that I was highly entertained and edified. Intelligent in conversation, affable and pleasing in his manners, in every respect a gentleman. A quiet summer evening had succeeded to the conversation of the day; the sky was cloudless and bright with stars, but without moon, whose crescent outlines were as yet scarcely visible though the deep red of the horizon as I passed to the Jennings Hotel where I took lodgings for the night. The following morning, accompanied by Mr. Wm. Jennings, with horse and carriage, proceeded up the Mehoopany Valley, which opened out very beautifully before us, though a fine farming district, in the course of an hour reached the village of Forkston. It consisted of about seventy buildings, and is handsomely located on the Big Mehoopany. It has two churches, three stores and a flouring mill, with quite a number of industrious mechanics and bids fair to be a good place of business as soon as the railroad is commenced. Pursuing on our way up the Valley, we saw some very excellent farms, and the one County bridge lately built by Mr. Hiram Hitchcock, which appears to be a very excellent structure. From thence forward, mountains immediately overhung our way, passing a saw mill and deep ravines, with now and then a house, and clearing on our left, the road led us high up on the sides of the hills winding about strangely, occasionally offering lovely points of view; sometimes we had to ride along quite a narrow ledge on the mountain sides; at other times, after a succession of varied scenery, large quantities of granite rock was passed on either side; on a turn, a singular granite ledge brought us in sight of lofty mountains between which rolled down a small stream called Stony Brook, glittering like a silver thread in the sunshine as it foamed along and leaped into the wild valley below. The scene was indeed one to call forth the wonder and admiration of even more experienced travelers. Leaving the terrace we passed on to the top of a high conglomerated ledge, which it is said, rims the mountain chain, and were enchanted with the lovely mountain scenery that there so majestically displayed itself to our view. From thence the prospect kept changing until a turn in the road brought us to the fine farm of Mr. Charles Miller, on the top of a large mountain, who kindly furnished us feed for our horse, and after partaking of a hearty lunch, Mr. Miller volunteered his services as our guide, we proceeded on foot across his fields; on entering the woods our path lay along the old coal road for nearly two miles on nearly level lands under large spreading maple trees, and excellent sugar bush, which makes it a just object of pride to the people who inhabit those mountain regions. At length, at about two o-clock in the afternoon, we came in sight of the out crop of a three foot vein of a kind of middle species of coal, lying literally under one of the knobs and spurs of the Alleghany range, high up in the lofty mountains, fourteen miles from Mehoopany. This vein of coal has been worked to some extent, about 1000 tons have been mined and carried away. We entered the mine and descended along the gangway about twelve rods and found the vein slightly dipping to the southwest; the coal looked excellent and had the appearance of bitumen, although evidently a little harder. Our guide informed us that it ignited easily, and burned freely, and was of very good quality. These rocks, with their intervening coal strata, originally level in position, were crumpled or folded into their present form of alternate basins and ridges, by the same tremendous convulsions or slow changes which crowded up the Alleghany, and that since then the action or dilluvial and atmospheric agencies have worn away the upper or coal bearing strata on most of the higher and exposed points, leaving them in the troughs or depressions which were sheltered by the mountain rock, and left in the position we now find them: not far distant other out croppings are said to have been discovered on lower grounds. There may be nothing like regularity of deposit in this formation. Different seams or veins of coal may have been formed at the same time, or at different periods in the world’s history, but under similar circumstances, thus alternately elevated or depressed. The southwest portion of North Branch Township is undoubtedly rich with veins of the purest coal, which may yet emerge from the foot of the same mountains, their length and breadth. After satisfying our minds of the probable extent and value of the mines, we retraced our steps. The drive back to Mehoopany, mostly in the cool of the evening, was equally lovely, but the pleasures of nature are inexhaustible: with God’s blessing, lovelier still. The next evening was at my home in Mill City in time to partake of a late supper with a good appetite, after a three day’s trip to the coal fields of Wyoming Co.